photos of ‘fifty acres’ have been popping up on my instagram feed over the past couple of weeks and i was desperate to try it out, so thought i’d make it my place of study earlier this week. 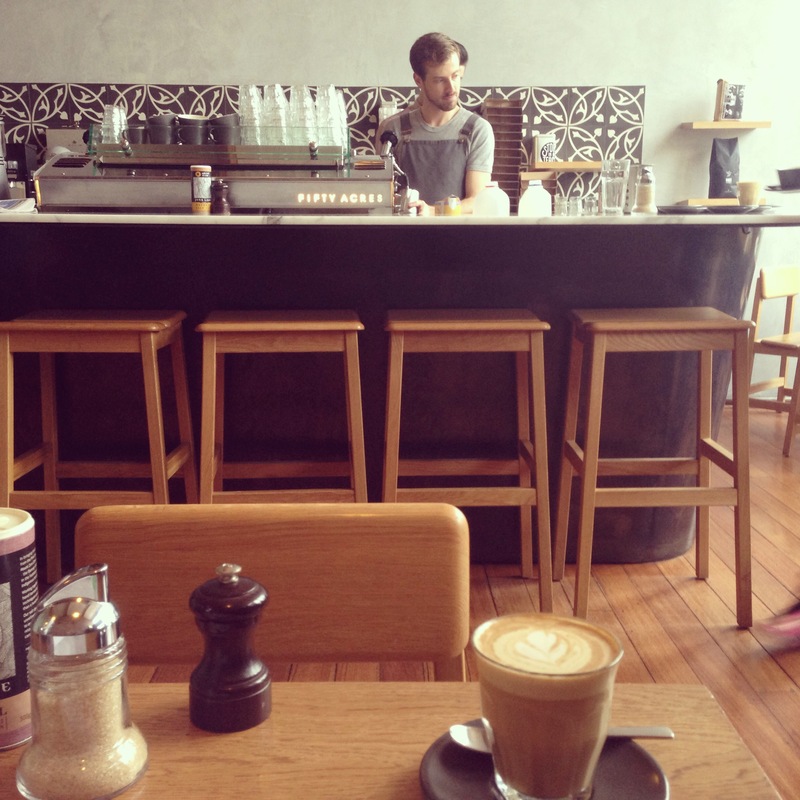 the cafe is located close to the intersection of bridge road and punt road in richmond – a very accessible destination by tram from the CBD. for those less-familiar with richmond, bridge road is famous for outlet shopping + furniture stores but more recently it, and the surrounding streets, have developed into a bit of a foodie buzz-word (think: top paddock, touchwood, gypsey + musquito, three bags full, fonda, pillar of salt .. all within the same postcode!). choosing from such an exciting and varied menu was no easy feat but i eventually settled for the pancakes. and oh my goodness, so glad i did! absolutely delicious! i wasn’t sure what to expect when ordering something like pumpkin pancakes, but after the waitress reminded me how good pumpkin scones are, it all started to make sense. these pancakes were fluffy and light, and not overly-sweet. the pumpkin certainly added an extra dose of moisture + flavour, and the serving size was so generous i couldn’t get through it all. the tart-citrusy-meets-sweet-candied-walnuts combination was perfect. the only (very small) downside… i would’ve loved a slight bit more mascarpone. 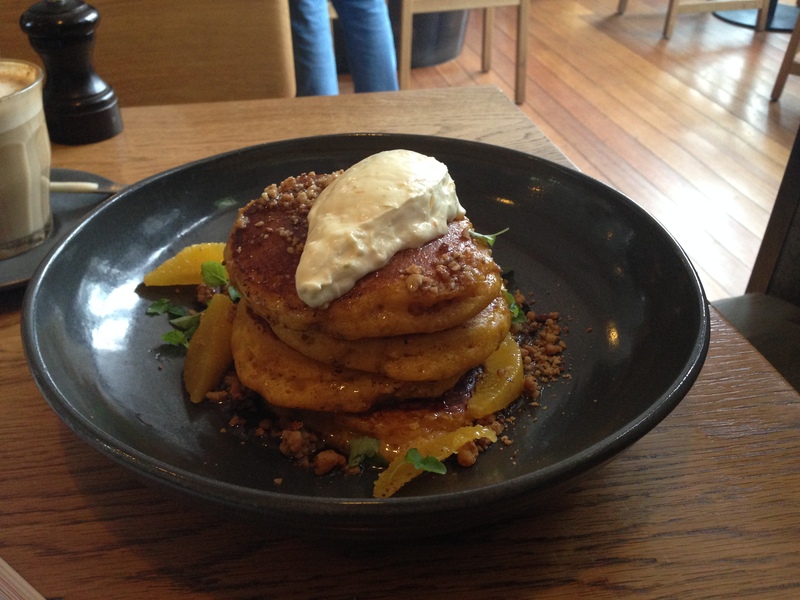 pumpkin pancakes with orange segments, citrus mascarpone, candied walnuts + canadian maple. the coffee was fabulous, and the staff were super-friendly. this small cafe was bustling and full much of the time i was there – always a sign of a good cafe! one thing is for sure – i WILL be back… next time to try the scotch eggs! verdict: there’s something special about this place!